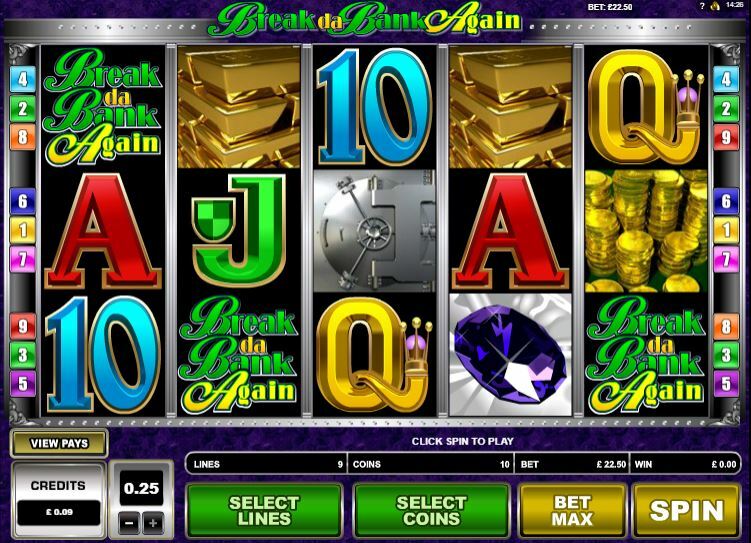 Get ready to join Microgaming on a mission to break into this bank and win some real cash prizes in this online casino game, Break Da Bank Again slot. This mobile slot features 3-reels and 5 pay lines and has some seriously old school vibes. Players who crave some classic casino slot action will really love this online slot as it takes its design from the live casino fruit machines and will have you feeling like you are playing in Vegas in no time at all. The design of the slot itself is super simplistic, and the graphics are very plain, with nothing that really stands out, but instead focusing on the classic style. The logo and backdrop features open bank vaults which are brimming with cash waiting for you to collect it if you can successfully Break Da Bank Again! If you fancy your chances against the bank, explore easy and discover more.. The main symbol in the game, is the Break da Bank symbol. This symbol is representative of the wild symbol and it also acts as a multiplier. It will double the pay out of a combination you land on the reels that one symbol completes as a wild symbol. It will quadruple the pay out of a combination that two symbols complete as wild symbols! If multiple symbols appear on an enabled pay line and they are in a line, this wild symbol will create its own winning combination meaning bigger pay outs! The maximum pay out of this online slot game is 2400 coins so get spinning to start winning! Despite the fact that this game is very simplistic, it does have an old school charm and is a welcome break from the frills and noise that is becoming more and more popular. If you want to take a step back and enjoy the stripped back casino game, this is the one for you. Give Lucha Maniacs a try!